To Cite: Azami M, Badfar G, Shohani M, Mansouri A, Soleymani A, et al. The Prevalence of Depression in Pregnant Iranian Women: A Systematic Review and Meta-Analysis, Iran J Psychiatry Behav Sci. 2018 ; 12(3):e9975. doi: 10.5812/ijpbs.9975. Context: Depression is a common problem during pregnancy. Depression has several adverse effects on the mother and infant. Evidence Acquisition: The present study was conducted to investigate the prevalence of depression in pregnant women in Iran. This study was performed based on the Preferred Reporting Items for systematic reviews and meta-analyses (PRISMA) guidelines. We searched the literature in the national and international databases, including Magiran, Barakat knowledge network system, SID, RICST, Iranian National Library, IranDoc, Scopus, PubMed, Elsevier (Science Direct, Embase, and Scopus), Web of Science (ISI), and Google Scholar using Persian and English (MeSH) keywords. Cochran’s Q test and I2 index were used to assess the heterogeneity between studies. A random-effects model was used to estimate the pooled prevalence using comparative meta-analysis software ver. 2. Results: Forty studies containing 15,870 Iranian pregnant women were included in the Meta-analysis. The heterogeneity of the studies was estimated to be high (I2 = 99.70%, P < 0.001). The prevalence of depression was estimated to be 41.22% (95% CI: 33.88 - 48.96). The prevalence of mild, moderate, and severe depression was estimated to be 23.71% (95% CI: 16.39 - 33.01), 10.67% (95% CI: 7.02 - 15.98), and 4.30% (95% CI: 2.33 - 7.80), respectively. The lowest and highest depression prevalence was estimated in the West of Iran (34.41% [95% CI: 17.38 - 56.67]) and the South of Iran (51.69% [95% CI: 37.32 - 65.78]), respectively, and the test result for subgroup analysis was not significant (P = 0.60). Based on the subgroup analysis, the prevalence of depression in the first, second, and third trimester of pregnancy was estimated to be 50.52% (95% CI: 39.91 - 61.08), 44.96% (95% CI: 26.92 - 64.42), and 48.33% (95% CI: 36.64 - 60.20), respectively, and the test result for subgroup analysis was not significant (P = 0.11). Most of the studies (57.5%) used the Beck’s questionnaire to survey the prevalence of depression in pregnant Iranian women and the prevalence of depression according to this questionnaire was estimated to be 45.84% (95% CI: 35.47 - 56.60). Conclusions: According to the high prevalence of depression in pregnant Iranian woman, identification and treatment of depression during pregnancy seem essential. Thus, program designing and implementation are recommended for improving the psychological health of pregnant women. Pregnancy is an important period in women’s lives, which is often associated with emotional and mood changes (1, 2). Depression is the most common mental disorder that reduces the ability of people and hinders the growth and development of the individuals. According to the world health organization (WHO), depression is the most important cause of disability in women worldwide (3). This disorder in individuals is characterized by feelings and symptoms such as impaired memory, weight loss, anorexia, feeling bad about themselves, feeling of guilt, hopelessness, thoughts of self-harm, discomfort, low self-esteem, depressed mood, and sadness (4). Depression during pregnancy is a common problem in pregnant women. Its causes are associated with genetics, history of a mental disorder, physiological and social changes, hormonal changes, physical problems such as nausea and recurrent vomiting, fatigue, sudden pains during pregnancy, and concerns about the health of the fetus and even delivery (5, 6). Untreated depression may have short-term and long-term effects on the mother, including high-risk behaviors, preeclampsia, increased risk of postpartum depression, and pregnancy outcomes such as low birth weight, premature birth, small head circumference, increased distress after delivery, and disrupted sleep (7-9). In addition, depression in pregnancy is related to a range of adverse pregnancy outcomes such as social isolation (10), marital discord (11), child’s delay in motor and intellectual development (12), fetal growth restriction, and high-stress response in infants (13, 14). Studies report various prevalence rates for depression in pregnant women in Iran (15% to 88.7%) and there is no exact estimate of it (15-48). Systematic reviews and meta-analyses can provide a complete view of a problem in the community by examining all relevant documentation and provide a clear picture (49-51). Given the importance of depression during pregnancy, this study aimed to investigate the prevalence of depression among pregnant women in Iran using the meta-analysis method. The present study is a systematic review and meta-analysis of all the current research literature on the prevalence of depression in pregnant women in Iran. This study was conducted based on the preferred reporting items for systematic reviews and meta-analyses (PRISMA) guidelines (51). To avoid bias, search, selection of studies, quality assessment, and data extraction were conducted by two researchers independently in each step. In case of disagreement, the results were evaluated by a third researcher. The national and international databases, including Magiran, Barakat knowledge network system, SID (Scientific Information Database), Regional Information Center for Science and Technology (RICST), Iranian National Library, IranDoc, PubMed, Elsevier (Science Direct, Embase, and Scopus), Web of Science (ISI), and Google Scholar search engine were searched without time limit until 2017. Resources were found by two researchers independently, who were experts in searching databases. The search mechanism was mainly based on systematic searches using Persian and English (MeSH) keywords, including “prevalence”, “depression”, “mental disorders”, “mental health”, “pregnancy”, “pregnant woman”, “prenatal care”, “pregnancy complications”, “epidemiology”, " prevalence " and “Iran” as well as their combination using “AND” and “OR” operators. In order to find more studies, references of all relevant articles were reviewed. The combined search in the PubMed database is shown in supplementary file Appendix 1. The main inclusion criteria in this study included studies on the topic of depression prevalence in Iran. The exclusion criteria included: (1) non-randomized sample size; (2) non-pregnant subjects; (3) irrelevance; (4) insufficient data for non-reported prevalence of depression; (5) sample size with a history of mental illness or depression medication users; and (6) Reviews, case reports, and editorial letters. Papers selected by the researchers were reviewed using the modified Newcastle Ottawa Scale (NOS) for cross-sectional studies (52). The checklist contains 8 sections in 4 categories. The method for scoring; 0 - 1 points were awarded to each item; therefore, the maximum attainable point was 8. The studies were separated into three categories: 1- Low quality: < 5, 2- Moderate quality: 5 to 6 scores and 3- High quality: 7 to 8 scores. Finally, studies with a minimum of  score were selected for the meta-analysis. The researchers used a checklist containing the required information such as researcher(s) name, title, year of study, place of study, study design, sample size, age (mean ± standard division), gestational age, used questionnaire, the prevalence of depression, the intensity of depression (mild, moderate, and severe), and the pregnancy trimester. The binomial distribution was used to calculate the variance of each study. To assess the heterogeneity of the studies, Cochran’s Q test and I2 statistic were used. Due to the heterogeneity of the studies, a random effects model was used to combine studies (53, 54). Sensitivity analysis was conducted to show the effect of omitting one study on the overall estimate at a time (55). To find the source of heterogeneity, the subgroup analysis was performed based on the geographic region, questionnaires and pregnancy trimester. In addition, the meta-regression model was used based on the year of study. Publication bias was assessed by Egger and Begg’s test. Data were analyzed using comparative meta-analysis (CMA) software ver. 2. A P value lower than 0.05 was considered significant. Forty studies containing 15,870 pregnant women were included in the meta-analysis. The mean age of participants in 13 studies (available data) was 25.90 ± 0.36 years. 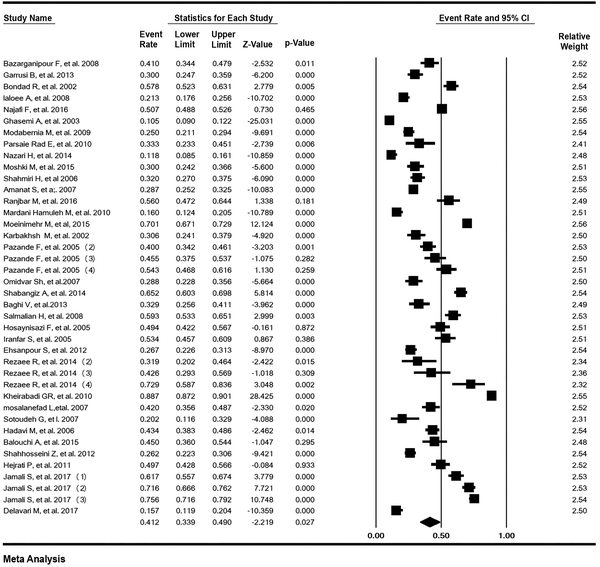 Study details included in the meta-analysis are shown in Table 1. The heterogeneity of the studies was estimated to be high (I2 = 99.70%, P < 0.001). The prevalence of depression in pregnant Iranian women was estimated to be 41.22% (95% CI: 33.88 - 48.96). The lowest and highest prevalence was found in Ghasemi’s study (20) in Tehran in 2002 (10.5%) and Kheirabadi’s study (40) in Isfahan in 2007 (88.7%), respectively (Figure 2). The results of sensitivity analysis showed that the overall estimated point after omitting one study for the prevalence of depression was robust (Figure 3). The subgroup analysis of the prevalence of depression in pregnant women according to the geographical region is shown in Table 2. The lowest and highest prevalence of depression in pregnant women in Iran was related to the West of Iran (34.41% [95% CI: 17.38 - 56.67]) and the South of Iran (51.69% [95% CI: 37.32 - 65.78]), respectively, and the test result for subgroup analysis was not significant (P = 0.60). Most of the studies (57.5%) used Beck’s questionnaire to survey the prevalence of depression in pregnant Iranian women and the prevalence of depression according to this questionnaire was estimated to be 45.84% (95% CI: 35.47 - 56.60). The lowest prevalence of depression was in the General Health Questionnaire (GHQ) (21.53% [95% CI: 8.97 - 43.32]) and the highest prevalence of depression was in the Patient Health Questionnaire (PHQ) (70.10% [95% CI: 67.14 - 72.90]). The test result for subgroup analysis was significant (P < 0.001) (Table 2). Abbreviations: CI, Confidence interval; N, Number. The subgroup analysis of the prevalence of depression in the first, second, and third trimester of pregnancy was estimated to be 50.52% (95% CI: 39.91 - 61.08), 44.96% (95% CI: 26.92 - 64.42), and 48.33% (95% CI: 36.64 - 60.20), respectively, and the test result for subgroup analysis was not significant (P = 0.11). The prevalence of mild, moderate, and severe depression in pregnant women was estimated to be 23.71% (95% CI: 16.39 - 33.01), 10.67% (95% CI: 7.02 - 15.98), and 4.30% (95% CI: 2.33 - 7.80), respectively (Figure 4). The prevalence of depression in pregnant women in Iran had a significantly increasing trend according to the year of study (P < 0.001) (Figure 5). Figure 5. 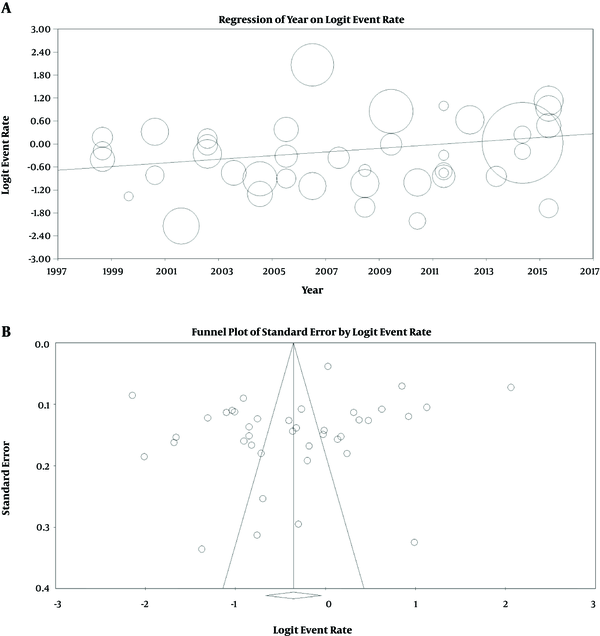 Meta-regression model for the prevalence of depression in pregnant women in Iran according to the year of study (A) and Funnel-plot of standard error by logit event rate (B). The P-value for publication bias in Egger and Begg’s tests was estimated to be 0.08 and 0.33, respectively, which was not statically significant (Figure 5). The present study is the first systematic review and meta-analysis on the prevalence of depression during pregnancy in Iran. In this study, heterogeneity was 99.7%. There are three categories for heterogeneity: below 25% (low heterogeneity), 25 - 75% (moderate heterogeneity), and over 75% (high heterogeneity) (53, 54); therefore, the present study is in the high heterogeneity category and a random effects model was used in the meta-analysis. The overall and sub - grouped prevalence of depression in pregnant women were studied based on geographical regions, the used questionnaires and trimester of pregnancy. The overall prevalence of depression during pregnancy in Iran was 41.22%. According to the systematic reviews and meta-analyses in other countries, the prevalence of depression has been reported to be 7.4% to 12% (5, 56, 57), indicating that the prevalence of depression during pregnancy among pregnant Iranian women is higher than in other countries. This difference may be due to the lack of social support and the difference in addressing psychological problems during pregnancy besides the development of these countries in health services or in medical material compared to developing countries such as Iran. Moreover, according to a review article of 15 studies by Veisani and Sayehmiri (58), the prevalence of postpartum depression in Iran was reported to be 28.7%, which is lower than the results of the present study. This indicates that the importance of depression in Iranian pregnant women during pregnancy is higher compared to postpartum depression. The American College of obstetricians and gynecologists suggests that screening for depression during pregnancy should also be considered potentially after the delivery (59). The weak points of the study of Veisani and Sayehmiri (58) compared to this study are the smaller sample size and non-random selection of samples in most studies that entered the meta-analysis process. Several questionnaires including Beck, Symptom Checklist 90-Revised (SCL-90R), Depression anxiety stress scales- 21 (DSSA21), GHQ, PHQ and Edinburgh postnatal depression scale (EPDS) were used in these studies and the prevalence of depression in pregnant women in Iran was reported to be 10% - 89%. Possibly the most obvious cause of this difference is the diversity of diagnostic tools used in the studies. For example, in the study of Moshki et al. (24), who used EPSS questionnaire to assess depression, 30% depression was reported. Bondad et al. (17) estimated the prevalence of depression to be 58% with the Beck questionnaire. That is why a subgroup based on the diagnostic tool was also analyzed and it was found that most studies (57.5%) used Beck questionnaire and prevalence of depression during pregnancy in Iran, according to the Beck questionnaire was estimated to be 45.84%, and the overall estimate was not significant, while the test result for subgroup analysis according to questionnaires was significant. The prevalence of depression in term of intensity during pregnancy was estimated to be 23.71%, 10.67%, and 4.30% for mild, moderate, and severe depression, respectively, while the highest prevalence of depression was in the mild range. This suggests that clinical and psychological programs and treatments can prevent the development of depression in pregnant women and thus prevent fetal and maternal complications of depression. In the present study, the prevalence of depression in the first, second, and third trimester of pregnancy was 50.52%, 44.96%, and 48.33%, respectively. A review article by Bennett et al. (56) reported the prevalence of depression in the first, second, and third trimester of pregnancy to be 7.4%, 12.8%, and 12%, respectively, which is much lower than our results. Experiences of women in any trimester of pregnancy are based on their individual experiences. The first, second, and third trimesters are respectively the stage of pregnancy admission process with ambivalent feelings (pleasure and hate) about the fetus, embryo adoption stage with a primary focus on the fetus, narcissism and depression, and finally, the preparation stage of pregnancy associated with increasing dependence of pregnant women to people around them (60). The most comprehensive study in terms of sample size and methodology is related to a study by Najafi and Kiani (19), in Tehran among 2,721 women in the third trimester of pregnancy, reporting the prevalence of depression during pregnancy as 50.7%. This finding is consistent with our estimates. 1) National databases did not provide the possibility for a combined search. 2) Blood and hormonal risk factors were not considered in any of the studies. 3) There were no study to check job satisfaction, pregnancy satisfaction, etc which can effect depression among women in pregnancy. Considering the prevalence of depression in this study and the importance of maternal and fetal complications before and after birth, identification and treatment of depression seem essential. Hence, it is recommended that medical policy-makers design and implement plans for improving the mental health in pregnant Iranian women. We are thankful to the women’s reproductive health research center for financial support. Authors’ Contribution: Milad Azami and Marzieh Parizad Nasirkandy conceived and designed the study and gathered the data. All authors drafted the manuscript and revised it critically. Funding/Support: The women’s reproductive health research center in Tabriz University of Medical Sciences financially supported the study. 1. Lara MA, Le HN, Letechipia G, Hochhausen L. Prenatal depression in Latinas in the U.S. and Mexico. Matern Child Health J. 2009;13(4):567-76. doi: 10.1007/s10995-008-0379-4. [PubMed: 18581222]. 2. Azami M, Badfar Gh, Shohani M, Mansouri A, Yekta-Kooshali MH, Sharifi A, et al. A meta-analysis of mean Vitamin D concentration among pregnant women and newborns in Iran. IGOJI. 2017;20(4):76-87. 3. Campagne DM. The obstetrician and depression during pregnancy. Eur J Obstet Gynecol Reprod Biol. 2004;116(2):125-30. doi: 10.1016/j.ejogrb.2003.11.028. 4. Bahrami N, Bahrami S. [Correlation between prenatal depression with delivery type and neonatal anthropometric indicators]. Koomesh. 2013;15(1):39-45. Persian. 5. Lewis AJ, Galbally M, Bailey CM. Perinatal mental health, antidepressants and neonatal outcomes: findings from the Longitudinal Study of Australian Children. Neonatal Paediatr Child Health Nurs. 2012;15(3):21. 6. Pearlstein T. Depression during Pregnancy. Best Pract Res Clin Obstet Gynaecol. 2015;29(5):754-64. doi: 10.1016/j.bpobgyn.2015.04.004. 7. Grote NK, Bridge JA, Gavin AR, Melville JL, Iyengar S, Katon WJ. A meta-analysis of depression during pregnancy and the risk of preterm birth, low birth weight, and intrauterine growth restriction. Arch Gen Psychiatry. 2010;67(10):1012-24. doi: 10.1001/archgenpsychiatry.2010.111. [PubMed: 20921117]. [PubMed Central: PMC3025772]. 8. Dayan J, Creveuil C, Marks MN, Conroy S, Herlicoviez M, Dreyfus M, et al. Prenatal depression, prenatal anxiety, and spontaneous preterm birth: a prospective cohort study among women with early and regular care. Psychosom Med. 2006;68(6):938-46. doi: 10.1097/01.psy.0000244025.20549.bd. [PubMed: 17079701]. 9. Hobel CJ, Goldstein AMY, Barrett ES. Psychosocial Stress and Pregnancy Outcome. Clin Obstet Gynaecol. 2008;51(2):333-48. doi: 10.1097/GRF.0b013e31816f2709. 10. Brummelte S, Schmidt KL, Taves MD, Soma KK, Galea LA. Elevated corticosterone levels in stomach milk, serum, and brain of male and female offspring after maternal corticosterone treatment in the rat. Dev Neurobiol. 2010;70(10):714-25. doi: 10.1002/dneu.20805. [PubMed: 20518015]. 11. Leinonen JA, Solantaus TS, Punamaki RL. Parental mental health and children's adjustment: the quality of marital interaction and parenting as mediating factors. J Child Psychol Psychiatry. 2003;44(2):227-41. [PubMed: 12587859]. 12. Goodman SH, Rouse MH, Long Q, Ji S, Brand SR. Deconstructing antenatal depression: What is it that matters for neonatal behavioral functioning? Infant Ment Health J. 2011;32(3):339-61. doi: 10.1002/imhj.20300. [PubMed: 28520144]. 13. Gaynes BN, Gavin N, Meltzer-Brody S, Lohr KN, Swinson T, Gartlehner G, et al. Perinatal depression: prevalence, screening accuracy, and screening outcomes. Evid Rep Technol Assess (Summ). 2005;(119):1-8. [PubMed: 15760246]. [PubMed Central: PMC4780910]. 14. Lewis AJ, Austin E, Galbally M. Prenatal maternal mental health and fetal growth restriction: a systematic review. J Dev Orig Health Dis. 2016;7(4):416-28. doi: 10.1017/S2040174416000076. [PubMed: 26983652]. 15. Bazarganipour F, Lameian M, Taghavi A. [Depression during pregnancy is associated with social support and adverse life events]. Aflak. 2008;4(10-11):19-27. Persian. 16. Garrusi B, Razavi Nematallahee V, Etminan A. [The relationship of body image with depression and self-esteem in pregnant women]. J Health Dev. 2013;2(2):117-27. Persian. 17. Bondad R, Abedian Z, Hassanabady H, ESMAEILI H. The relationship between sleep pattern and depression in pregnant women in the third trimester. J Kermanshah Univ Med Sci. 2005;9(2):41-51. Persian. 18. laloee A, Kashanizade M. [Determining rates of depression among pregnant women referred to hospital care of the rest of pregnancy (aj) and Najmieh Tehran]. J Med Counc IR. 2008;26(3):317-23. Persian. 19. Najafi F, Kiani Q. [The Relationship Between Depression and Anxiety of Pregnantwomen with Anthropometric Indicators in Newborns]. Zanjan Univ Med Sci. 2016;24(105):107-18. Persian. 20. Ghasemi A, Taghipoor Anvari R, Birashk B, Moradi Lakeh M. [Psychological status of pregnant women referred to health centers in Tehran]. Razi J Med Sci (RJMS). 2003;10(36):585-98. Persian. 21. Modabernia M, Shodjaei Tehrani H, Heydari Nezhad S. [Survey the Frequency of Depression in the Last Third Months of Pregnancy]. J Guilan U Med Sci. 2009;18(71):19-25. Persian. 22. Parsaie Rad E, Akbari SAA, Sadeghniiat K, Alavi Majd H. [Relationship between sleep disorder and pregnancy depression in primigravidae referring to health–treatment centers of Ahvaz Jundishapur University of Medical Sciences in 2010]. J Shahid Sadoughi U Med Sci. 2011;19(4):454-62. Persian. 23. Nazari H, Farhadi A, Jariayani M, Hosseinabadi R, Asgari S, Majidimehr M. [Mental health of pregnant women referred to Khorramabad health centers]. Yafteh. 2014;16(2):40-8. Persian. 24. Moshki M, Armanmehr V, Cheravi K. [The relationship between depression during pregnancy with social support and some demographic variables in pregnant women]. The IJOGI. 2015;18(142):11-2. Persian. 25. Shahmiri H, Momtazi S. [The prevalence of depression and its relationship with the individual characteristics of pregnant women]. Med J Tabriz Univ Med Sci. 2006;28(2):83-6. Persian. 26. Amanat S, Sadeghi A, Ahmadzadeh G, Omranifard V, Afshar H. [Prevalence of depression in pregnant women and its relationship with]. Hormozgan Med J. 2007;10(4):329-34. Persian. 27. Ranjbar M, Heydarzadeh M, Yazdani M, Mirghafourvand M, Mirza Ahmadi F. [Comparison of Depression in Women during Pregnancy and Postpartum Period]. J Psychology. 2016;10(40):73-85. Persian. 28. Mardanihamule M, Ebrahimi E. [Mental health status of pregnant women referring to shahinshahr health care centers]. J Nurs Midwif Gorgan. 2010;7(1):27-33. Persian. 29. Moeinimehr M, Foroghipour A, Shokrani S, Goli S, Soleymani B. [Depression during Pregnancy and Preeclampsia in third Trimester in Women Attending Prenatal Care Center of Esfahan in 2010-2012]. J Nurs Midwif Gorgan. 2015;12(1):103-11. Persian. 30. Karbakhsh M, Sedaghat M. [Depression in pregnancy: Implications for prenatal screening]. Payesh. 2002;1(4):49-55. Persian. 31. Pazande F, Toomians J, Afshar F, Valaei N. [Prevalence of depression in parturients referring university hospitals in Tehran in 1999]. KAUMS Journal (FEYZ). 2002;6(1):66-70. Persian. 32. Omidvar S, Kheirkhah F, Azimi H. [Depression during pregnancy and its related factors]. Hormozgan Med J. 2007;11(3):213-9. Persian. 33. Shabangiz A, Ehsanpour S. [Association between depression and delivery type]. Hormozgan Med J. 2014;18(2):151-8. Persian. 34. Baghi V, Ghanei R, Roohi M, Ghoreishi H, Moradi N. [The Relationship between Antenatal Depression and Sleep Apnea]. IJOGI. 2013;16(52):18-24. Persian. 35. Salmalian H, Nasiri Amiri F, Khirkhah F. [Prevalence of pre And Postpartum Depression Symptoms and Some Related Factors (babol 2006-2007)]. J Babol Univ Med Sci. 2008;10(3):67-75. Persian. 36. Hosaynisazi F, Poorreza A, Hosayni M, Shojaee D. [Depression during pregnancy]. J Gorgan Uni Med Sci. 2005;7(1):60-5. Persian. 37. Iranfar S, Shakeri J, Ranjbar M, NazhadJafar P, Razaie M. Is unintended pregnancy a risk factor for depression in Iranian women? East Mediterr Health J. 2005;11(4):618-24. [PubMed: 16700376]. 38. Ehsanpour S, Shabangiz A, Bahadoran P, Kheirabadi GR. The association of depression and preterm labor. Iran J Nurs Midwifery Res. 2012;17(4):275-8. [PubMed: 23833626]. [PubMed Central: PMC3702146]. 39. 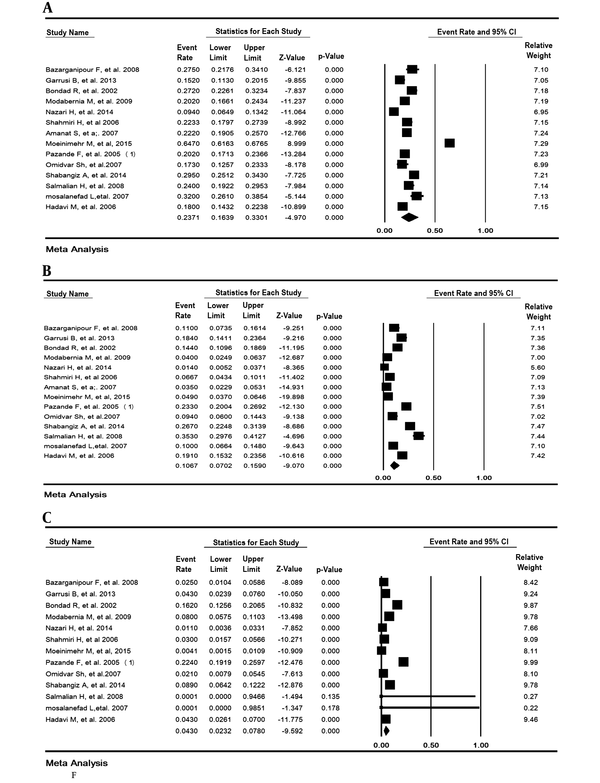 Rezaee R, Framarzi M. Predictors of mental health during pregnancy. Iran J Nurs Midwifery Res. 2014;19(7 Suppl 1):S45-50. [PubMed: 25949251]. [PubMed Central: PMC4402987]. 40. Kheirabadi GR, Maracy MR. Perinatal depression in a cohort study on Iranian women. J Res Med Sci. 2010;15(1):41-9. [PubMed: 21526057]. [PubMed Central: PMC3082779]. 41. Mosalanezhad L, Kheshti A, Gholami A. [The Assessing mental Health in pregnancy and relative psychopathologic factor in Jahrom]. Jahrom U Med Sci. 2007;5(3 and 4):23-9. Persian. 42. Sotoudeh G, Cyaci F, Lesan S, Mirsamadi R, Chammari M. [Evaluate the frequencyof anxiety and depression and related factors in women with increased androgen levels]. J Med Counc IR. 2007;25(4):482-9. Persian. 43. Hadavi M, Alidalaki S, Halakouei M. [Prevalence Of Depression In Women Referring To Health Centers]. Iran J Nurs Res. 2006;1(2):55-61. Persian. 44. Balouchi A, Kianian T, Ghoreishinia G, Keikhaie F, Seddighi S. Mental health status among pregnant women referred to hospitals in Zabol city (southeast of Iran). Der Pharmacia Lettre. 2015;7(9):346-8. 45. Shahhosseini Z, Esmaeeli Douki Z, Vaezzadeh N, Keshavarz Z. Maternal Depression and Preterm Delivery. World Appl Sci J. 2012;18(1):15-20. 46. Hejrati P, Jenabi E. The study of relationship between depression with the type of pregnancy (wanted and unwanted) in Tamine Ejtemaee Hospital in Iran. Procedia Soc Behav Sci. 2011;28:87-91. doi: 10.1016/j.sbspro.2011.11.018. 47. Jamali S, Rasekh Jahromi A, Javadpour S, Haghbeen M. The Relationship Between Intimate Partner Violence and Antenatal Depression: A Cross-Sectional Study in Iran. J Fundamental Applied Sci. 2017;9(2):1183-93. 48. Delavari M, Mirghafourvand M, Mohammad Alizadeh Charandabi S. The relationship of maternal–fetal attachment and depression with social support in pregnant women referring to health centers of Tabriz–Iran, 2016. J Maternal-Fetal Neonatal Med. 2018;31(18):2450-6. 49. Sayehmiri K, Tavan H, Sayehmiri F, Mohammadi I, V Carson KI. Prevalence of epilepsy in iran: a meta-analysis and systematic review. Iran J Child Neurol. 2014;8(4):9-17. 50. Sayehmiri K, Abangah G, Kalvandi G, Tavan H, Aazami S. Prevalence of peptic ulcer in Iran: Systematic review and meta-analysis methods. J Res Med Sci. 2018;23(8). doi: 10.4103/jrms.JRMS_1035_16. 51. Shamseer L, Moher D, Clarke M, Ghersi D, Liberati A, Petticrew M, et al. 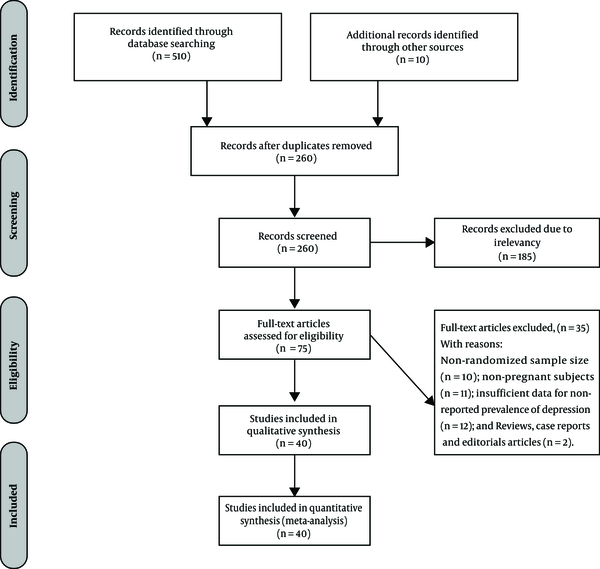 Preferred reporting items for systematic review and meta-analysis protocols (PRISMA-P) 2015: elaboration and explanation. BMJ. 2015;349. g7647. doi: 10.1136/bmj.g7647. 52. Wells GA, Shea B, O'Connell D, Peterson J, Welch V, Losos M, et al. 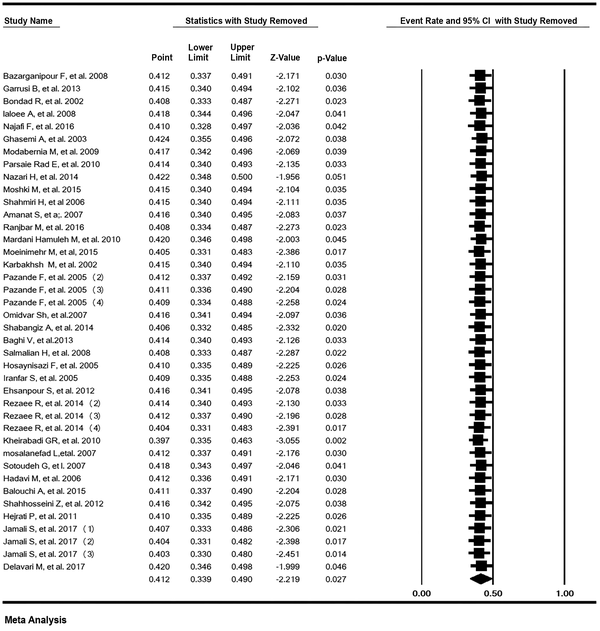 The Newcastle-Ottawa Scale (NOS) for assessing the quality of nonrandomized studies in meta-analysis. 2011. Available from: http://www.ohri.ca/programs/clinical_epidemiology/oxford.asp. 53. Higgins JP, Thompson SG, Deeks JJ, Altman DG. Measuring inconsistency in meta-analyses. BMJ. 2003;327(7414):557-60. doi: 10.1136/bmj.327.7414.557. [PubMed: 12958120]. [PubMed Central: PMC192859]. 54. Ades AE, Lu G, Higgins JP. The interpretation of random-effects meta-analysis in decision models. Med Decis Making. 2005;25(6):646-54. doi: 10.1177/0272989X05282643. [PubMed: 16282215]. 55. Tobias A. Assessing the influence of a single study in the meta-analysis estimate. Stata Tech Bull. 1999;47:15-7. 56. Bennett HA, Einarson A, Taddio A, Koren G, Einarson TR. Prevalence of Depression During Pregnancy: Systematic Review. Obstet Gynecol. 2004;103(4):698-709. doi: 10.1097/01.AOG.0000116689.75396.5f. 57. Gavin NI, Gaynes BN, Lohr KN, Meltzer-Brody S, Gartlehner G, Swinson T. Perinatal Depression. Obstet Gynecol. 2005;106(5, Part 1):1071-83. doi: 10.1097/01.AOG.0000183597.31630.db. 58. Veisani Y, Sayehmiri K. Prevalence of postpartum depression in Iran-A systematic review and meta-analysis. Iran J Obstet Gynecol Infertility. 2012;15(14):21-9. 59. Petrosyan D, Armenian HK, Arzoumanian K. Interaction of maternal age and mode of delivery in the development of postpartum depression in Yerevan, Armenia. J Affect Disord. 2011;135(1-3):77-81. doi: 10.1016/j.jad.2011.06.061. [PubMed: 21835474]. 60. Mohammadi Dareshouri Z, Bosaknejad S, Sarvghad S. A survey on the effectiveness of stress management training with cognitive-behavioral group therapy approach on state/trait anxiety, pregnancy anxiety and mental health of primiparous women. Jentashapir J Health Res. 2013;3(4):495-5.